You may think of zinc as "one of those metals we're supposed to eat." It keeps important enzymes functioning, and keeps roofs from rusting. It also makes one hell of a flamethrower, as we can see in this video. It was even used to make a special prototype flamethrower that was never used - because it was too dangerous. Zinc is a complacent little element. It's not poisonous - in fact it's good for you. It corrodes at an incredibly slow rate, so it's often used to coat metals and protect them. But combine it with a few groups of carbon and hydrogen, and it becomes diethyl zinc. 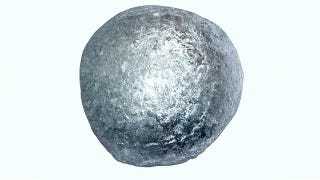 This element, while necessary to some industrial processes, is sparingly used. Possibly because it was once put forward as a kind of rocket fuel that didn't need a spark to make it ignite. Diethyl zinc will go up on contact with any element that's willing to give it oxygen, including, as we see in this video, oxygen itself. That's diethyl zinc making a syringe into a flamethrower. The compound actually was used in a prototype for a special type of flamethrower developed for the military. Flamethrowers, with their steady trail of fire, basically point the way to their operator's position. The diethyl zinc flamethrower prototype worked up by the Department of Defense, would throw packets of diethyl zinc, which would burst and go up in flames. The "encapsulated flamethrower" never made it past the early stages - possibly because carrying around packets of material that would burst into flames if even one packet broke was an impractical idea. But we can still see mad scientists mess around with the chemical.